The Localytics data team has released its annual App Marketing Guide, revealing the four biggest mobile app marketing insights from 2018, which should help brands plan mobile marketing strategies this year. During 2018, mobile app marketers had two main focuses: ensuring their user data was secure and making all campaigns personalised to the end user. Data in the report indicates these focuses are paying off. 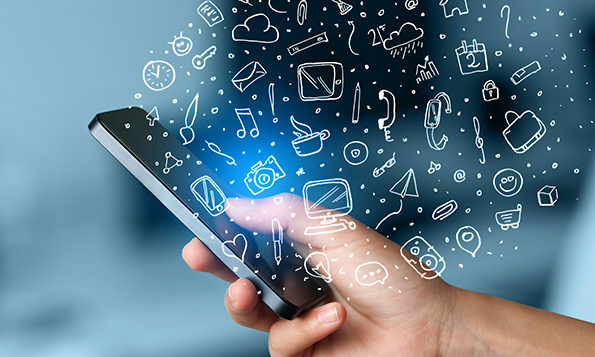 App engagement and retention are at their highest in years as mobile marketers start hitting their stride in terms of what works for their user bases. In addition, GDPR has forced every company to take a hard look at its data collection practices and ensure it meets rigorous standards. For mobile app marketers, using that data for good means using the tools at your disposal to create powerful one-to-one user experiences. Retention is the king of KPIs when it comes to mobile app marketing. The entire mission of mobile app marketers is figuring out how to create long term, valuable customers. App acquisition is still very important, but brands have learned to take advantage of targeted ad campaigns to ensure they attract the right users to your app – also leading to better retention. The previously mentioned positive lift in user retention and engagement plays right into the next insight: personalised push notifications prove they’re worth the effort in a big way. Segmentation and personalisation create a dramatic lift in engagement. Broadcast campaigns that use dynamic messaging – campaigns that, while sent to an entire user base, are catered to the users’ interests and demographic profile. These are often curated using simple attributes such as first name, last name, birthday, city, etc. 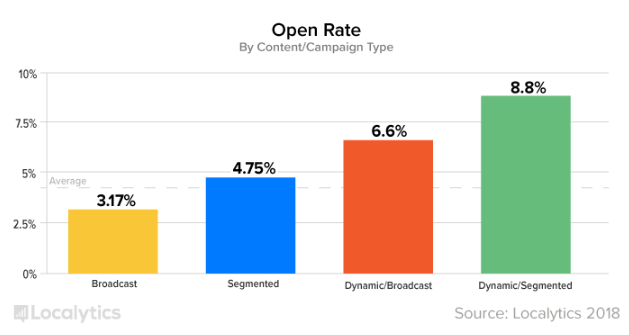 Segmented campaigns that use dynamic messaging. These are campaigns that take into account complex attributes to deliver a great experience for users. 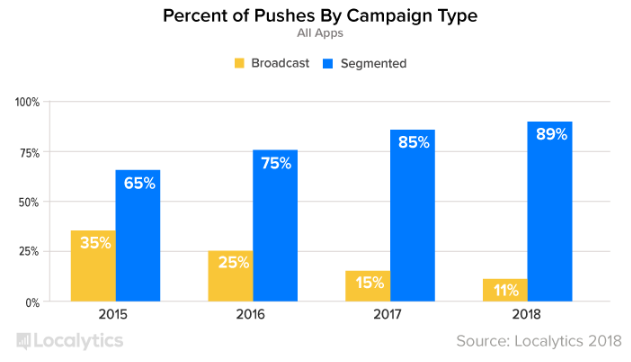 To understand the engagement impact of the push messaging campaign, marketers would take a look at how many times a user launched an app following a push. When brands take advantage of dynamic/segmented push campaigns, the engagement rate is more than double any other campaign type. The last but not least, location-based push notification campaigns convert three times more often than broadcast messages. The very purpose of mobile is realised with location-based messaging. It’s all about hitting a user with the right message at the right time; when it matters to them most. To succeed in 2019, double down on dynamic/segmented and location based push notification campaigns. Push notifications took off in 2015, which caused a rapid rise in app abandonment. Why? Because mobile marketers heavily relied on a batch and blast (or broadcast) approach as their push strategies. The problem is that push notifications are far too personal to users – coming directly to their phone’s home screen. Mobile users were quick to abandon apps who abused the technology. 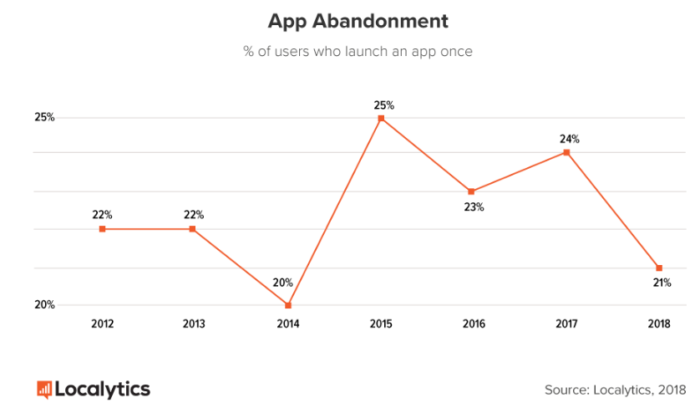 The guide finds that 21% of users abandon an app after just one use in 2018, it’s on the decline since 2015. 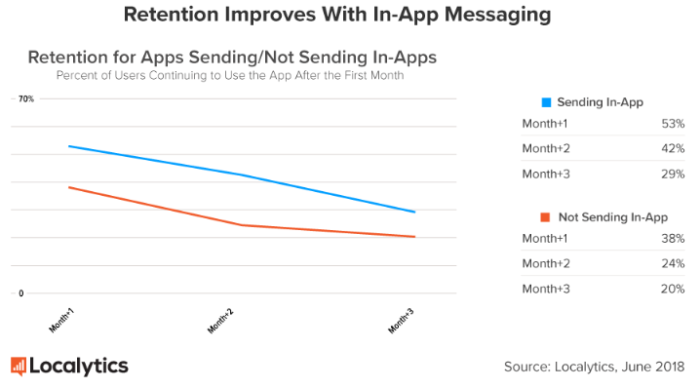 App abandonment rates should continue to improve directly alongside personalised mobile messaging strategies. 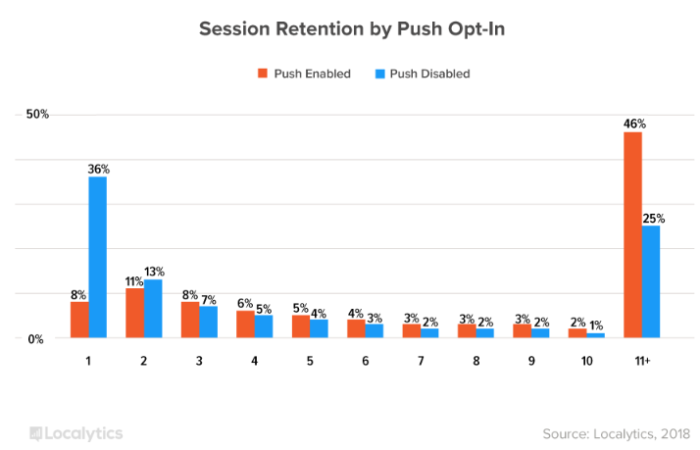 It’s a worthwhile investment given that nearly 50% of users will use an app 11+ times if they opt-in to push. What push notifications do to attract users back into your app, in-app messages do to keep them there. In-app messages keep users informed, engaged and moving along the funnel towards conversion. They’ve proven their value when it comes to user engagement, boosting retention by 75% in the second month. One of the most notable ways to take advantage of in-app messages is by using them for onboarding. App onboarding is a chance to clearly depict your app’s value to new users through a series of welcome screens. Mobile marketers who utilize app onboarding see a significant lift in retention over those who don’t. Regional - APAC consumers are less likely to prefer local brands over larger global brands, a study by Nielsen said. ..